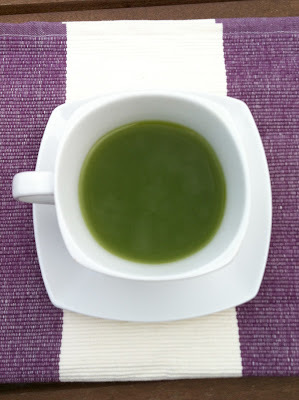 If you're a tea geek like me, you'll know that Matcha is the name given to the powdered green tea traditionally used in Japanese Tea Ceremonies (or 'Way of Tea'), where you'll likely see beautiful kimonos, specialist teaware and a carefully set-out tea room. These simple aesthetics together with Zen mindfulness makes the ritual involved in presenting tea into a meditation. A mixture of T'ai Chi Ch'uan and making a cup of tea, if you will! ...Fear not though stress 'eads! According to teapigs, their organic Matcha green tea is also a super power drink that gives you 137 times the antioxidants of regular green tea (which is why it's bright green) and an energy boost of up to 6 hours while keeping you all Zen! I once tried one at a café and could swear I was firing on all cylinders afterwards! Other benefits consist of enhanced learning, concentration and support to the immune system as well as weight-loss and healthy skin. 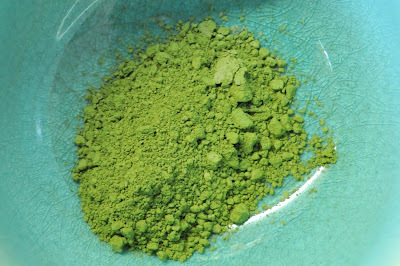 Matcha tea is grown away from direct sunlight and once picked, laid flat to dry before being stone-ground into its powder form. This means you actually consume the tea leaf itself, rather than tea infused water and this is what makes it super healthy and simple to use. In this powder form it can be added to a whole host of drinks (like my Matcha Mojitos), smoothies and food (check out my Matcha ice cream in my logo). The lesson here, is not to be put off by this tea by thinking it’s complicated and out of your league. So for this experiment, I thought I’d make matcha lattes as this is a modern twist on the otherwise traditional Matcha! Some of you may wonder how to make matcha, so for these lattes I sieved in half a teaspoon of teapigs organic matcha per cup with a tea strainer into soya milk and steamed it with the coffee machine steamer. My steamer isn't working it’s best lately so I gave it a little whisk at the end too and sprinkled some matcha powder on the foam for decoration. We sat down with our drinks together as although lattes and coffee drinking can be an independent experience, tea has always been social! We thought it tasted a little like 'tea semolina' with the soya milk and the tea being a little sweet! Surprisingly, there wasn’t any bitterness to it so we were pleased to think we could enjoy matcha lattes for the taste rather than hold our noses and neck them in the name of antioxidants! To be sure it wasn’t a fluke I made a teapigs 'skinny green' as well; just half a teaspoon with near boiling water in a teacup and gave it a little whisk. This definitely had that green tea taste you’d expect it to have, as opposed to other brands that can have a strange taste to it. It was slightly vegetal but very smooth with a touch of sweet. I braced myself for the thicker bit at the bottom thinking it'd be bitter, but it was fine and still pretty smooth for a concentrate of tea like that! It also had a welcomed long-lasting aftertaste. If this has got you excited for Matcha May I can offer a discount code for 15% off your tea online at teapigs! Just enter the code BLOGGERS12 at the checkout (excludes offers and gifts). They also have a newsletter you can sign up to on their website and of course like Tea Street, you can find them on Facebook and Twitter! So grab your matcha and have some fun experiments! I’d love to see what you come up with so feel free to share your pics! May we suggest flavored matcha? Try Strawberries & Cream Matcha - 30% OFF. Jin Jun Mei "Gleaming Brow"
Copyright to Tea Street blog..That's all folks!. Powered by Blogger.